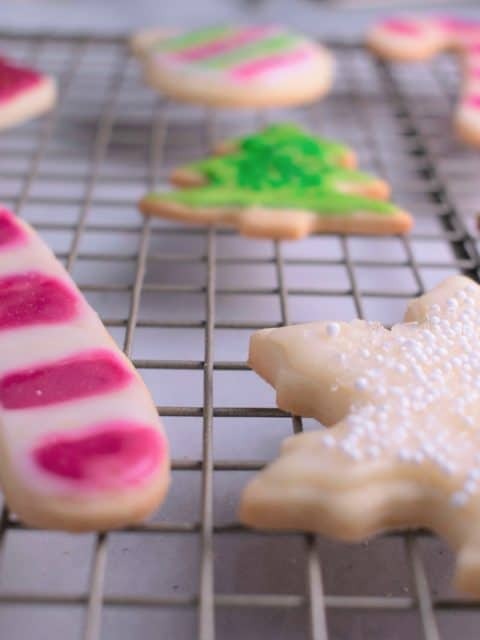 Cut-Out Holiday Sugar Cookies are a classic recipe that are fun to make and also taste just as great as they look with the addition of vanilla & almond extract added to them. 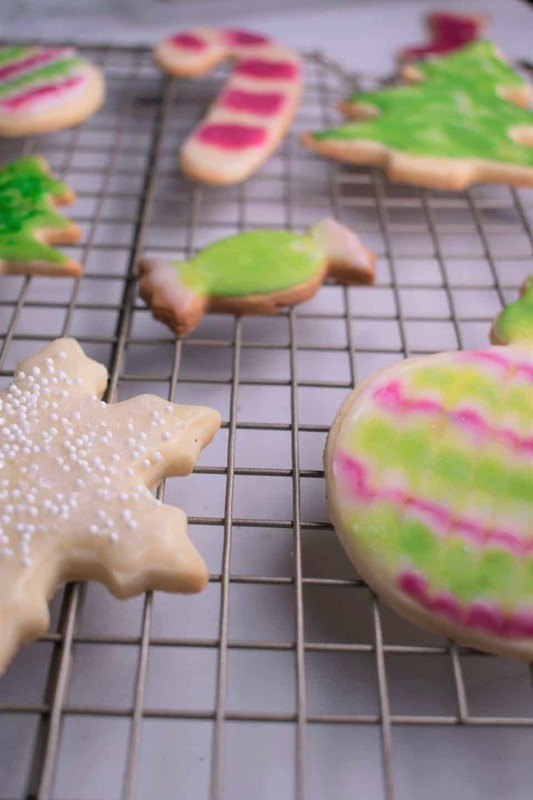 Sugar cookies can be as easy or as difficult as you make them. The dough itself comes together in 10 minutes – it’s what you do with it afterwards that can be something simple or rather intricate. For me personally, I enjoy landing somewhere right in the middle of that spectrum. Making them reminds me of an art project, which can be really fun, but if you’re making dozens of cookies it can be time consuming. Also, if I’m fretting over one cookie being perfect, would it be painful or rewarding to eat it afterwards? 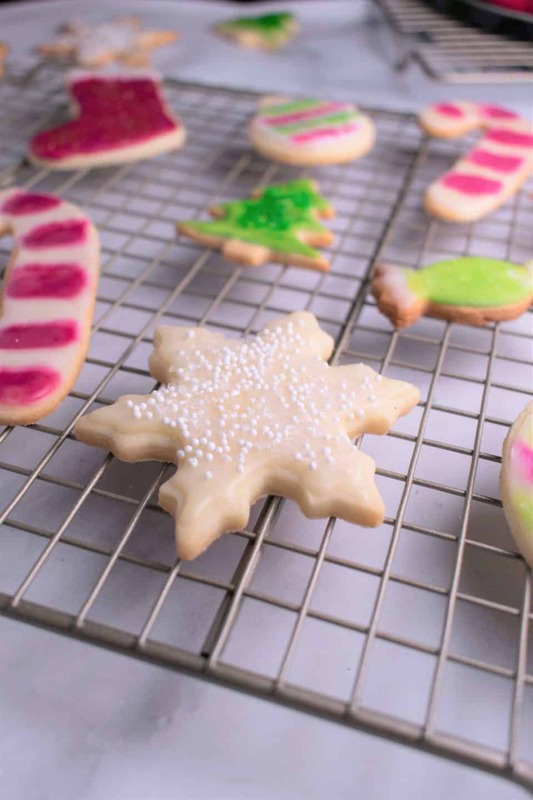 Sugar cookies sound like they’d just be loaded with sugar and have a very flat taste. Sometimes this is true, the cookie just tastes sort of ordinary. With the right balance of butter, flour, and sugar, I actually find that they remain a soft cookie with a little bit of chew that basically melts in your mouth. These are not a hard cookie that breaks in half, they’re more likely to fall apart on their own actually. This recipe also includes a touch of vanilla & almond extract, which makes the flavor a real stand-out. I’ve used the same recipe for years and have yet to be disappointed by it. It consistently gets so many compliments every year. The reason the dough needs to chill is so the butter in the dough can become a solid again. It’s important that when you’re rolling the dough out it’s not a melted separated mess. The colder the butter in the dough, the easier it will be to roll the dough, cut out shapes, and be sure that it’s not sticking to your cutters or the counter. So when it’s time for you to cut out shapes, you’ll want to cut them while the dough is cold & almost stiff. 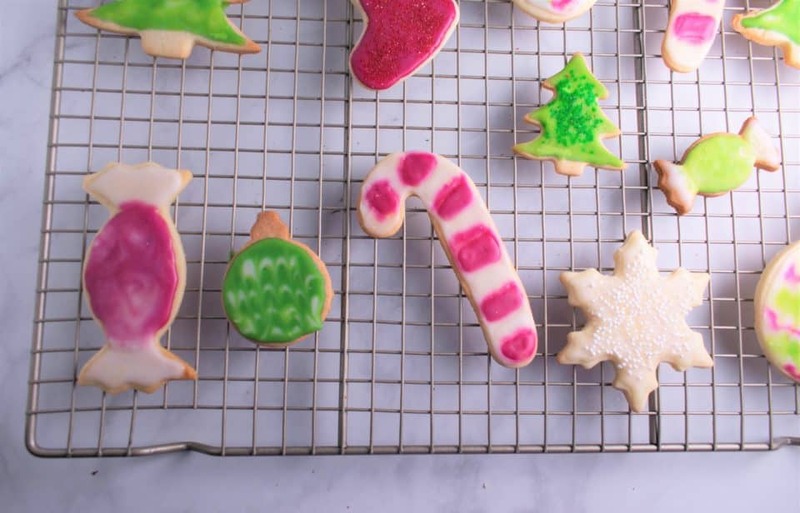 The shapes should pop-out easily from the cutters and you can place them right onto your baking sheet. If not, keep cutting until there’s no more space, pull up the unused dough, and use a spatula to move the cut cookie dough to your baking sheet. When you’re working with your dough, it’s going to get warm very quickly (like under 10 minutes). For this reason, I like to work in batches between my pieces of rolled out dough. Once one sheet gets too warm, I’ll wrap it back up and place it in the freezer and work on another sheet, etc. If your cookies are not holding their shape after they bake, it’s probably because you’re letting them sit out on the baking sheets while raw for too long. Again, when they warm up, the butter in the dough will melt causing the shape to not stay as firm. Before baking, pop your baking sheet in the refrigerator for a couple minutes for them to firm up first. Your cookies need to be fully cooled before frosting or they will melt the frosting and it will be running all over…not fun. Once they’re cooled, make a big batch of frosting and separate it into bowls for different colors. I used red, green, and white. I then spooned it into mini squeeze bottles. The easiest method for frosting is drawing the outline of the shape you want and then flooding the middle of it with frosting. Another trick I really like is using a toothpick to swirl colors together which looks so complicated and cool, but it’s crazy easy! Okay, but how do I simplify all this? Maybe you’re trying to make these to decorate with kids or you’re pressed for time, I hear you. The time consuming parts of this recipe are moments where you don’t need to do a thing. This includes: chilling the dough, waiting for the cookies to cool, and waiting for the frosting to harden. So, first make sure you have enough time allotted for each of those. Next: stick with simple shapes, think using a mason jar to cut out easy circles. For frosting, keep it simple and fun rather than making them look realistic. Like, drizzling color all over or flooding the whole cookie with one color and topping it with sprinkles. You can add just a touch more water to the frosting as well, so it spreads faster. In a large bowl using a handheld mixer or stand mixer, beat the butter until creamed. Add in the sugar and beat on high speed until light and fluffy, about 3-4 minutes. Add the egg, vanilla, and almond extract and beat on high until fully combined. Whisk the flour, baking powder, and salt together in a medium bowl. Add half the flour to the creamed butter, mix, and repeat for the rest of the flour. Divide the dough into two equal parts. On parchment paper, roll the dough out until its about ¼ inch thick. Cover with parchment paper and refrigerate for at least one hour. Once the dough has chilled and firmed up, preheat the oven to 350 degrees. Keep one of the rolled out cookie batters in the refrigerator to work on one at a time. Batter will warm up very quickly while working with it and its much easier to be cutting out shapes from very cold and firm dough. If your dough warms up, place it in the freezer for a few minutes while working on the other batch. You can either cut out your shapes and place the parchment paper its already on directly onto your baking sheet or transfer them with a spatula to the baking sheet. Re-roll the leftover dough into ¼ inch thickness and continue cutting until all the dough is used. Bake for 9-12 minutes, until the cookies are lightly colored around the edges. They will be soft when taking them off, so be careful. 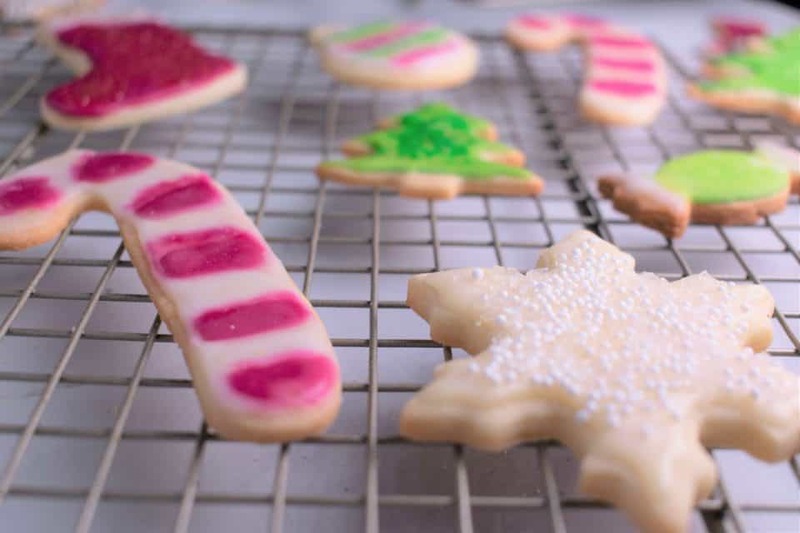 Allow cookies to cool on wire racks completely before icing. For the icing, whisk together the confectioner’s sugar, vanilla, pinch of salt, and 2 tablespoons water in a medium bowl. If its too thick, add in ½ tbsp more water. If its too thin, add in a tablespoon of confectioner’s sugar. Separate into smaller bowls and mix in desired food coloring. 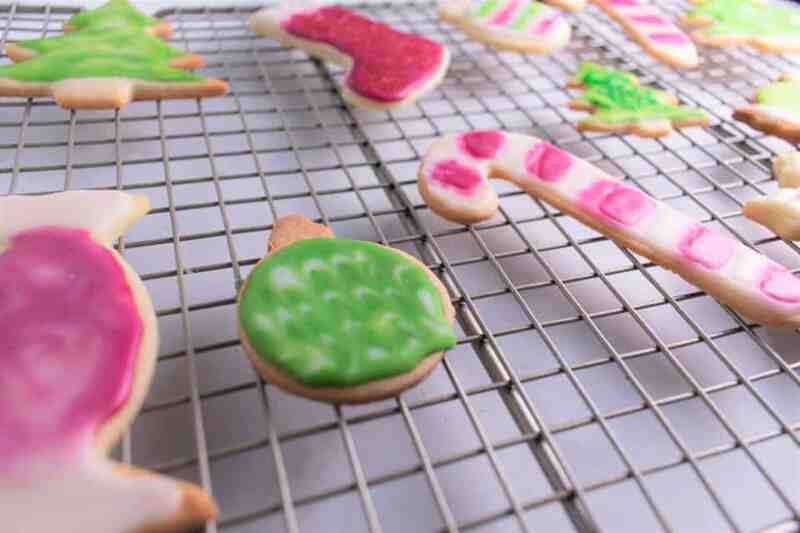 Decorate the cooled cookies however you like and leave the frosting to harden for at least 12 hours. You don’t need to cover the cookies as the icing sets. This recipe will easily double.